Discussion in 'Videocards - NVIDIA GeForce' started by bernek, Feb 11, 2019. The card is Gigabyte 1070GTX 8GB rev.2 Windforce OC (maybe I got some mistakes in the force and wind but this is it). Memory is Micron ... sad face because it doesn't want to OC (memory) close to nothing ... anything above +200 MHz in Afterburner (+100 effective that is) I get artifacts ... 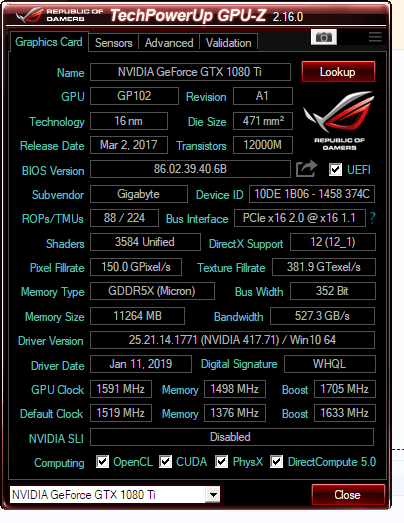 I tried the new "OC Scanner" and it doesnt overclock the memory only the GPU ... I got there 150-200 MHz extra across the frequency range pretty happy with that ! I've read about a bug with memory voltages for these cards especially Micron issues ... but at least a +200 (effective clock for memory) should be expected ... what am I doing wrong ?! 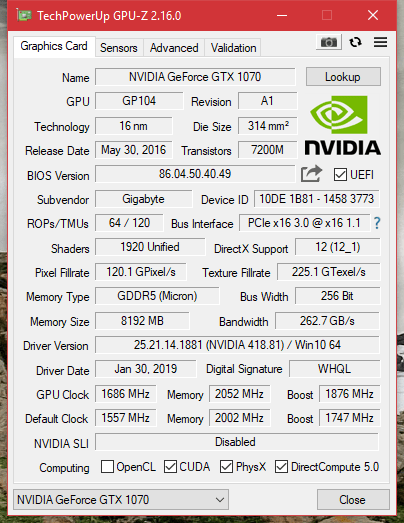 I've had an 1060 GTX 6GB and memory was easily overclockable to +400 MHz in AF meaning 200 effective. expect for voltage and power target there's nothing you can do to get it more stable. I maxed the voltage and power target and did a custom curve using MSI Afterburner so basically I can't change memory timmings or overvolt memory ? Can I write a different bios from a better card maybe memory gets some more voltage ? Either way the card performs quite a lot better compared to RX580 8GB ... I smell a 30% increase sometimes maybe more... happy with it because I got it cheap and helps me with 2K res that I play on ... with RX580 I struggled at medium settings majority of titles and with this 1070 overclocked (as much as I could) I can get high settings maybe some ultra here and there at 2K pretty amazing for me ! +200 in Afterburner is +400mhz effective. So +100 in Afterburner, would be +200mhz effective. My bad but still not happy with Micron or its overclock capabilities. On the GPU side I'm happy but not memory ... does this Pascal need more memory bandwidth badly ? or I'm just hunting something that is not needed (gaming wise). It will hardly give you 3 % fps depending on the game. Just because Samsung had some good memory kits doesn't mean everything else is trash. There's also Samsung memory that wouldn't OC properly. The why the hell I'm trying to overclock the vram ... I will just leave it be and be happy with the GPU clock increase (curve) from Afterburner and game more play with settings less. sadly pascal scales very well with memory overclocks than with core clocks. so you do need that memory overclock. Try to overclock manually and not use OC scanner. With my GTX1070, I can OC the memory very high, but I've found if I go past a certain point, I lose performance. I find +300 on the memory to be a sweet spot. I can't say I had that experience myself. OC Scanner only scans core clock. Do you know what you'ree talking about? Hence why i mentioned overclocking the memory manually. oc scanner just works with core which does not add much to gaming..... You will benefit much more from a memory oc. that's not true neraly all generations scale better with core clock. we might be talking about different things. once you hit around 2050Mhz on the core you're nearly at the end of the line. However most cards only bosst to 1900 - 1950. getting the core to 2050 is 100% the most significant fps boost. if you had a high end factory oc you might have the impression that only memory gives you a boost. in games the fps increase from memory oc was never as big as in benchmarks. and there's other tests out there which show what I've experiened, so I'm gonna leave it at that. GDDRX5 and GDDR6 are fast enough on their own and don't need excessive memory oc.